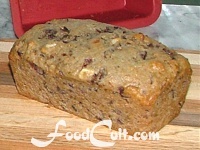 Coffee Cakes &amp; Dessert Breads - Free, Easy Recipes @ FoodCult.com - A Place for Galganov's Recipes and More - Food Matters! Coffee breads may be quick breads (raised with baking powder and/or baking soda and salt) or yeast raised. In all cases, these are fun as a snack, with coffee or other beverages ... or, even, as a breakfast slice. Most quick breads can be made as muffins as well although the length of time and/or temperature must be adjusted. Yeast raised breads can, also, be done as mini-loaves but remember, a small loaf will likely cook more quickly. Again, these are sweetened and, so, are not bread substitutes. They are and should be treated as "treats". As is always the case, we use mostly organic ingredients (flour, etcetera) and, when possible, will substitute whole wheat flour for at least a portion of the (unbleached) white flour and, of course, we use organic cane sugar and, when including fruit, always try to use unsweetened, organics as available/possible. Yeast raised coffee loaves can be a little tricky but never get discouraged. They only get better.